The U 47 fet Collector’s Edition is Neumann’s definitive microphone, reissued in the year 2014. 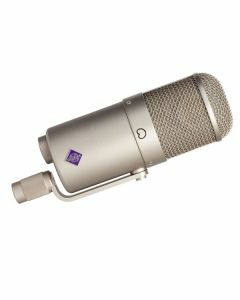 Production of this timeless mic has resumed according to the innovative vintage production documents and schematics. It is shipped with a premium wooden case and a unique certificate displaying the microphone’s serial number. In terms of mechanical design, a lot of the components used by the U 47 fet also feature in the U 87. The U 47 fet is a condenser microphone with a cardioid directional characteristic and fet 80 circuit technology, characterised chiefly by a wide dynamic range. The K 47 double large-diaphragm capsule was already utilised in the U 47, the fabled tube-based predecessor of the U 47 fet. The K 47 provides a slight boost in the range above 2 kHz. If necessary, a switchable low-cut filter pushes the lower cutoff frequency electronically from 40 Hz to 140 Hz, thus subduing unwelcome low frequencies (such as impact sound and wind noise), or helping to offset for the proximity effect. Switchable attenuation can decrease transmission levels by 10 dB, facilitating the processing of very high sound pressure levels of up to 147 dB. Furthermore, to prevent overloading of the connected preamp, the output signal can be reduced by 6 dB via a switch on the bottom of the microphone. In order to guarantee sure stable positioning, the microphone is swivel-mounted on an assimilated bracket. The bracket stand connector has 5/8"-27 internal thread, with an adapter for 1/2" and 3/8" threads. The microphone cable can be safeguarded at the side of the stand connector, by using the knurled nut to fasten it in the slot (for cable diameters of up to 5 mm). The microphone is available in classic nickel.